UFC Lightweight Alexander "The Great" Hernandez drops by to talk about his upcoming fight with UFC fan-favorite Donald “Cowboy” Cerrone. which takes place 19 January in Brooklyn, New York. Alex is very excited for the opportunity, and though he admires Cowboy - he is looking forward to another impressive victory in the Octagon. UFC Featherweight 'Super' Sodiq Yussuf to talk about his UFC Adelaide victory over then-undefeated Suman Mokhtarian. The fight was Yussuf’s official UFC debut after earning a UFC contract on Dana White’s Tuesday Night Contender Series with an impressive win over Mike Davis. UFC Lightweight and US Army Engineer Officer, Matt "The Steamrolla" Frevola joins Rodney James to talk about his all out war with Lando Vannata in the featured Fight Pass prelim for UFC 230. On this special edition Battlecast with Kyle "Gumby" Gunther of Battlecross he joins Rodney James to talk Metal and also helps breakdown UFC 229 in the aftermath of the biggest fight in UFC history between Conor McGregor and Khabib Nurmagomedov. In this episode of The Bloody Sabbath Podcast, Rodney James questions the logic behind the immediate rematch between TJ Dillashaw and Cody Garbrandt as well as the idea of a championship changing hands on a split decision. In this episode, Rodney James breaks down the UFC Calgary Main Event. He keeps it 100 as he explains why there is nothing controversial about Dustin Poirier vs Eddie Alvarez II, why Joanna and Jose Aldo are back (but not all the way back) and why Alexander Hernandez is the future of the UFC Lightweight division. Two opponents who will face off on Dana White Contender Series, JR Coughran and Alex Gilpin join Rodney James to discuss their upcoming bout which will take place in Las Vegas at the Ultimate Fighter Gym on 7 August 2018. 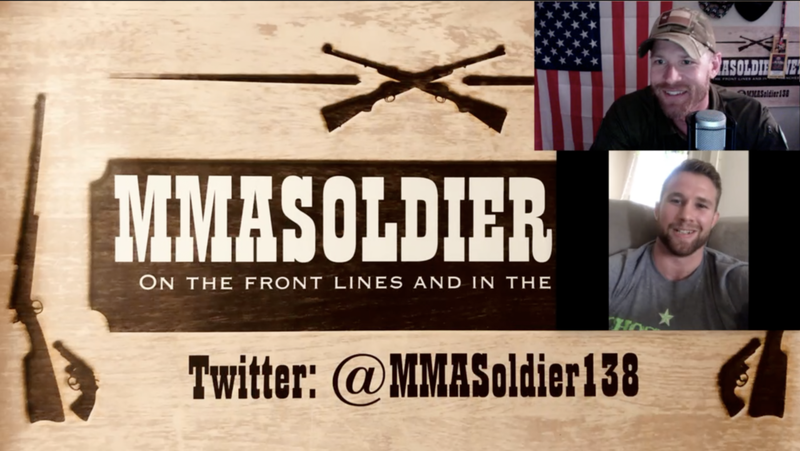 UFC veterans Gerald "Hurricane" Harris and Tom "The Tank" Gallicchio join MMA Soldier to breakdown the weekend of fights and the shenanigans surrounding Bellator 199 and UFC 224. Gerald Harris recently signed a 4 fight deal with Bellator and has an upcoming fight that has yet to be announced as of this writing. LFA Veteran Cheyenne Vlismas spoke with Rodney James "The Rockstar" Edgar as she is set to Make Invicta Debut May the 4th in Kansas City. UFC's Gina "Danger" Mazany joins MMA Soldier ahead of her UFC Liverpool fight against No. 15 Ranked Lina Lansberg and "Smilin" Sam Alvey gets on the line for the 2nd half of the show. Alvey has a Light Heavyweight fight with No. 15 ranked Gian Villante in Utica, NY on June 1st. UFC Welterweight Matt "The Immortal" Brown joins MMA Soldier via Facebook LIVE ahead of his UFC Glendale co-main event against Carlos Condit. Brown returns from a short retirement after a brutal elbow KO of veteran Diego Sanchez. The Immortal talks about his upcoming fight, as well as his custom line of strength and conditioning equipment: Immortal Combat Equipment. And as always, Matt Brown drops some knowledge about fitness, music and philosophy. Pro MMA fighter (13-4) and US Army vet, Ray "the Judge" Rodriguez checks in to give us a status update on his fighting future and he also talks about his teammate Alex Hernandez' earning a big upset at UFC 222 as well as his experience with the Army Combatives Program. U.S. Army Soldier, Major Jason "Righteous" Norwood joins MMA Soldier to speak about everything from Army life, to balancing his military and professional fighting career. Social Media Entrepreneur, Motivational Speaker and U.S. Army Veteran John Burk joins Rodney James Edgar on the MMA Soldier Facebook Live feed for a discussion of politics, social issues and military service. This is an old episode of 5 Minutes Alone with Ultimate Fighter winner and Active Army Sergeant First Class, Colton Smith.